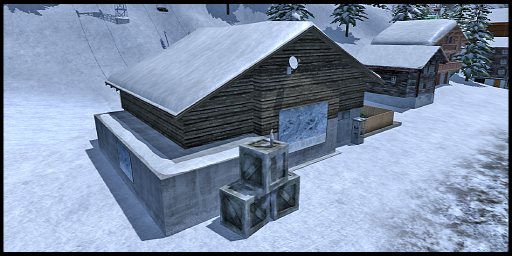 This guide describes how you can create mod maps for Ski Region Simulator 2012. Please post questions and feedback in this thread in the official GIANTS support forum. The slopes are defined by the Info Layer called 'slopeInfoLayer'. To edit this, please see the section Info Layer. The values of this Info Layer define where which slope is. The channels define the binary value of the slope number. The Nav Mesh called 'skierNavMesh' defined where the skiers drive. It's easiest to use the 'Build Navigation Mesh Tool' in the GIANTS Editor. To do this, first select the existing 'skierNavMesh' object in the Scenegraph panel, if available, and then click in the menu 'Create->Navigation Mesh'. In the dialog you should set the following Values. The values which are written bold, are values which are different to the default values of the dialog. If the default settings have been changed before, these values must be reset manually. Once you set all the settings, press 'Recreate' if the object 'skierNavMesh' was selected before, otherwise press 'Create' and then rename the newly created Nav Mesh to 'skierNavMesh'. The creation might take several seconds to minutes, depending on your computer and the scene complexity. Hint: If the Nav Meshes are not shown in the viewport, you can let them show by selecting in the menu 'View->Show->Navigation Meshes'. The pedestrian areas are defined with Nav Meshes. You can use as many Nav Mesh as you want, however for performance reasons, as less as possible should be used. In fact, usually only one is needed. The easiest way to create this Nav Mesh, is by using the Info Layer 'pedestrianInfoLayer'. Once you painted all your pedestrian areas, you should select the existing 'pedestrianNavMesh' object in the Scengegraph panel, if available, and then open the build dialog in the menu 'Create->Navigation Mesh'. In this dialog you should set the following Values. The values which are written bold, are values which are different to the default values of the dialog. If the default settings have been changed before, these values must be reset manually. Once you set all the settings, press 'Recreate' if the object 'pedestriansNavMesh' was selected before, otherwise press 'Create' and then rename the newly created Nav Mesh to 'pedestriansNavMesh'. Further the User Attribute 'onCreate' with the type 'script callback' and the value 'NavMeshPedestrians.onCreate' must be added. guiIcon (optional) The filename of the image used as the icon for the station. If you use your own name for the station, this is required. stationImage (optional) The filename of the image for the station. If you use your own name for the station, this is required. The id attribute of the ski stations in the XML are one-based child indices of the nodes in the I3D, which are under the node 'skiStations'. 1 means the 1st child. Each ski station may habe multiple extra facilities. There is a distinguishion between extensions and common facilities. Extensions define for each station an exact list of the facilities the player can chos from, while die common facilities have the same list for each station. price Price of the extension. This is only the price of the base building, but not of the furnishings. node Zero-based child index of the extension node in the i3d. 2 means the 3rd child of the ski station I3d node. The common facilities all have the same possiblie facilities, accordingly you don't need to precise the list of facilities in the XML. Further all nodes in the I3D must have the same objects. number The number of common facility slots at this station. price Price of each common facility slot. This is only the price of the base building, but not of the furnishings. node Zero-based child index of the common facilities node in the I3d which contains childs, one for each slot. 2 means the 3rd child of the ski station I3d node. id The id of the slope. The area of the slope is defined by the pixels in the 'slopeInfoLayer' with the same number. startStationName Name of the ski station where the slope starts. endStationName Name of the ski station where the slope ends. difficulty Difficulty of the slope (1, 2, 3). Each guest prefers only one difficulty, thus the ski region should have approx. the same number of slopes for each of the difficulties. 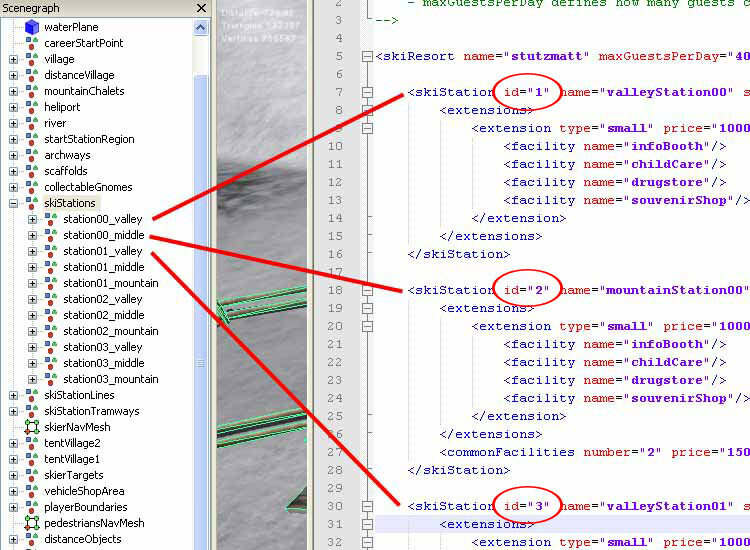 Note: The 'chalet' nodes in the SampleModMap SkiSlopes XML are not used, and can be ignored or deleted. id The id of the hotel. This is the one-based child index of the hotel node in the hotels node. 1 is the 1st child. price Price of the hotel. Gui positions in the XML define the positions of the gui elements. These are X and Y coordinates between 0 and 1, where 0 0 is the left bottom and 1 1 is right top corner. The values define the left bottom corner of the gui elements. This position for example can be determined with the console command gsDrawGuiHelper. To do this, enter 'gsDrawGuiHelper 0.1' in teh console (0.1 can also be replace with a different value as you like), and then move the mouse cursor to the requested position. The two values around the mouse cursor are the X and Y values which you can enter in the XML. To remove the displayed grid again, you can enter 'gsDrawGuiHelper' in the console. Hint: Console supports auto completion. E.g. enter gsDraw in the console and press 'tab'. It will automatically extend to gsDrawGuiHelper. To toggle between different suggestions, press 'tab' multiple times. The Info Layers allow you to draw various information directly in the GIANTS Editor. Currently this is used for the slopes, the pedestrian areas and to define the snowed areas. To draw this Info Layers, you click on the Info Layer icon in the toolbar. Open the Terrain Editing panel in the menu 'Window->Terrain Editing'. In this panel, select the according Info Layer in the drop down list, then select the channels you like and paint directly in the viewport. The functions 'Add' and 'Sub' are supported, which by default are mapped to the left and right mouse button. The radius of the brush can be changed in the gui or with the keys 'v' and 'b'. The drawn is shown as white areas on the terrain. Only the areas which match the selected channel combination exactly are shown. E.g. if only channel 1 is selected, areas were both channel 1 and 2 is painted are not shown. The option 'Erase Unmasked' just below the Info Layer Channels, defined whether the the channels that are not selected are deleted from the areas you paint, or only the selected channels are added to the existing. Normally you should have the checkmark checked und should only be changed for rare situations. To specify your own ski station names, you need to select a unique identifier for the station. In the following example we want to add the station Zurich. For this we select "zurich" as the unique identifier. We need to specify this in the "name" attribute of the node "skiStation" in the SkiResort XML. The next step is to specify the texts (name and description) of the station that are displayed in the GUI. These texts need to be added in the "l10n" section of the modDesc.xml. The name is specified in the l10n text with the name station_<uniqueName> and the description in stationDescription_<uniqueName>. I.e. for this example it is "station_zurich" and "stationDescription_zurich". When changing the identifier of a station, don't forget to also adjust the "stationAbove" and "stationBelow" attributes of the ski stations which refer to the changed station. Also the "startStationName" and "endStationName" attributes of the slopes in the SkiSlopes XML possibly need to be changed. Finally, you need to specify the icon and the image of the station. This need to be done with the attribute "guiIcon" and "stationImage". See SkiResort XML.